Nebeth Carbajal, 38, has a U.S. passport showing he was born in Florida. But when he filed immigration papers on behalf of his Mexican father last month, U.S. consular officials asked for more details of his birth, leaving a family in limbo. His U.S. birth certificate states that Nebeth Carbajal was born in Florida on December 6, 1979. But now, 38 years later, U.S. government is doubting his citizenship. When he filed a petition this year to bring his father to the United States, U.S. consular officials in Ciudad Juarez asked him to prove where, when and how he was born, including photographic evidence. 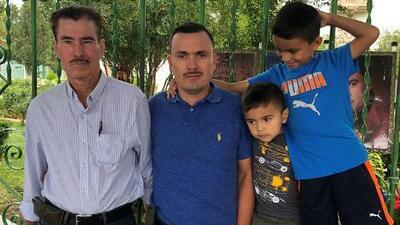 The father of four U.S.-born children, Carbajal is one of a growing number of people whose official birth records show they were born in the United States but are finding their citizenship questioned by U.S. officials. In other cases, The Trump administration has accused Hispanics along the border of possessing fraudulent birth certificates. The Washington Post reported last month that “passport applicants with official U.S. birth certificates are being jailed in immigration detention centers and entered into deportation proceedings.” In some cases they are stuck in Mexico, their passports suddenly revoked when they tried to reenter the United States. The government alleges that from the 1950s through the 1990s, some midwives and physicians along the Texas-Mexico border provided U.S. birth certificates to babies who were actually born in Mexico. In a series of federal court cases in the 1990s, several birth attendants admitted to providing fraudulent documents. In Carbajal’s case, he was born almost 1,500 miles from the border with Mexico, delivered he says, in the house where his parents were living, by an aunt. He settled near Austin, Texas, married his Mexican wife, Patricia, and started a family. Their four children, Alondra, 12, Jesica, 11, Emanuel, 6 and Nebeth 3, were all born in the United States. In 2011, Carbajal contacted an immigration lawyer in Tallahassee, Florida explaining his situation. The attorney, Elizabeth Ricci, had never seen a case like Carbajal’s and that a so-called ‘delayed birth certificate’ would be tough to obtain from the Florida Bureau of Vital Statistics. “I was told I needed a court order. They are rarely done,” she said. They began assembling the documents he would need to prove his citizenship, including his baptismal certificate from St Philip’s Catholic Church in Belle Glade, his parents’ marriage and birth certificates, his education documents from the town of Bejucos in Mexico. That included an official document of “non-citizenship” in Mexico, which confirmed that there is no record of his being born in Mexico. Eventually, a judge in Palm Beach County issued an order in September 2012 to the Florida Department of Vital Statistics to issue the birth certificate. A little more than a month later Carbajal was issued his official birth certificate. Soon after that he was issued a U.S. passport by the State Department. Ricci didn’t hear from Carbajal again until last month when she got a worried text from Carbajal. He was in Ciudad Juarez with his father and his wife and had just come from an interview with U.S. consular officials. He was in the final stages of an immigration petition, known as an I-130 Form, to have his 60-year-old father, Placencio Carbajal, join him in the United States. At the same time, his wife was also seeking to become a legal resident. He sent Ricci an official consular document, dated September 10, which gave him two weeks to supply copies of a long list of documents, including “pictures of the Petitioner’s birth,” as well as “payments receipts for medical assistance during or after the petitioner’s birth,” among others. "You could say it's funny ...."
Carbajal, a house painter in Austin, was able to return to the United States to assemble the documents with the help of his attorney. His wife stayed behind with their youngest two children. Ricci has submitted the documents on September 17, and is awaiting a response. "You could say it's funny, except it's ridiculous," said Carbajal. "It's frustrating as we already went through an entire investigation in the court and now they want more. It seems they can ignore whatever they want." In her letter to the consulate, Ricci described the document request as “outrageous” and was “an insult” to the State of Florida and the Palm Beach judge who ordered that U.S. birth be recognized. Some experts say the the Trump administration appears to have adopted extreme new vetting guidelines, especially in cases involving Mexico. "Consular officials all over the world are being told to toughen up everything," said John Feeley, a former U.S. ambassador who served in Mexico and is now a Univision analyst. "I understand why the consul is asking these questions because of the late birth registration, but why are they reopening a settled passport case?" he added. Feeley also questioned why the consular official doubted Carbajal's passport but still let him use it to re-enter the United States. “By allowing Mr Carbajal to retain and use his passport to return to the US, the consul implicitly accepted that it was valid proof of citizenship and ID to be presented at the border to request re-entry back into the US. Therefore, the question that must be answered is WHY is that same document NOT accepted to legally petition for his father's Immigrant Visa?" he said.